Cats Herd You - Page 2 of 491 - Laugh. Learn. Love cats. Cupcake had a very busy week last week. 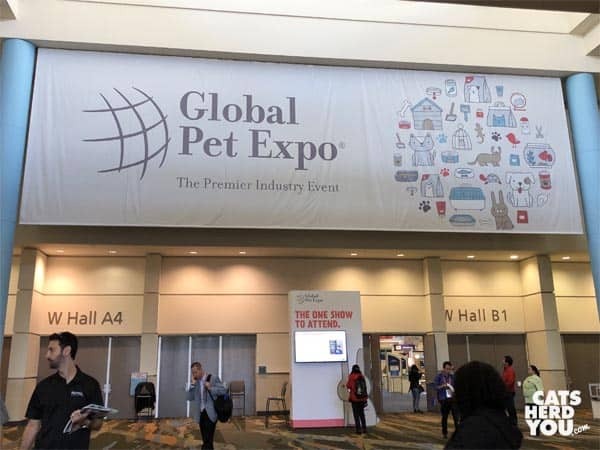 She went on her first visit ever to Global Pet Expo, where the pet industry shows retailers what new products they have available. 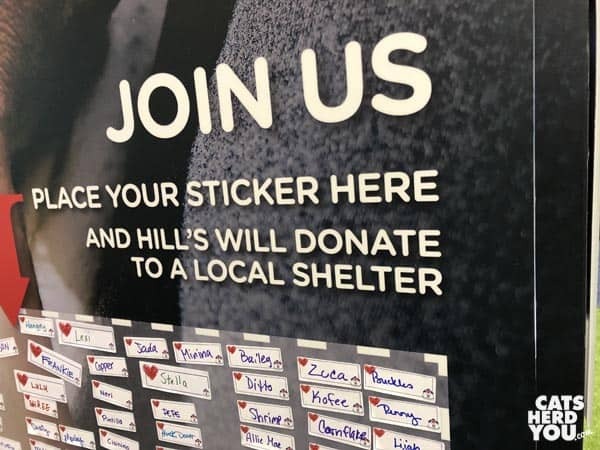 They had activities for attendees at various booths, like putting your pet’s name on a sticker and adding it to a board for Hill’s to make donations to a local shelter. 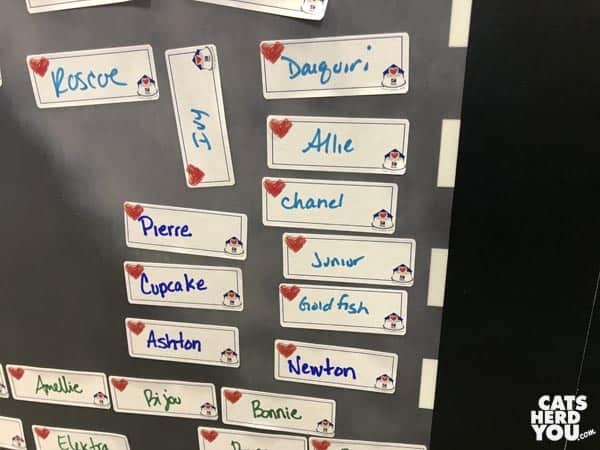 As you can see, Pierre, Cupcake, Ashton, and Newton were all represented. 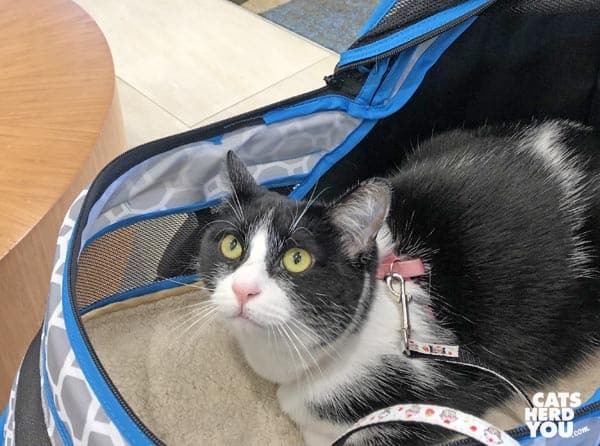 There were a surprising number of pets attending the event. 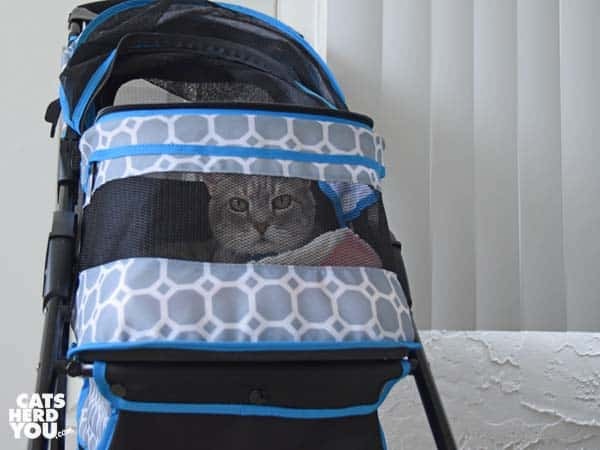 Most of them were small dogs in strollers, and people were always surprised to look into Cupcake’s stroller and find a cat inside instead of a dog. Cats and dogs weren’t the only animal attendees. 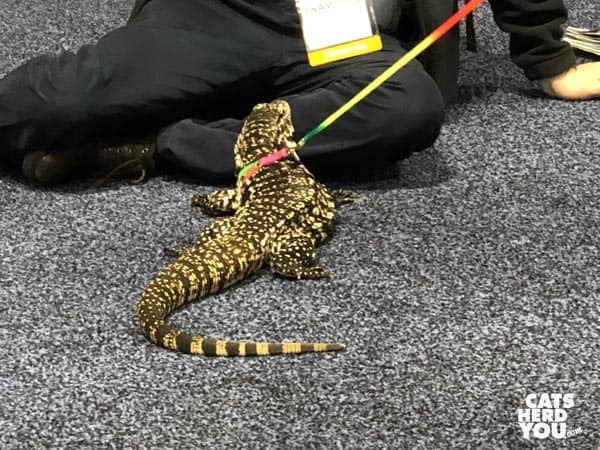 A beautiful lizard on a leash was there, too. We ran into her several times, but Cupcake didn’t notice her at all. 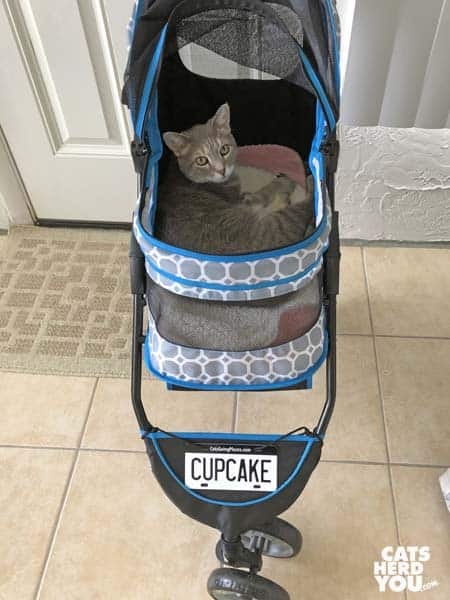 Cupcake had the chance to check out some of the new products. 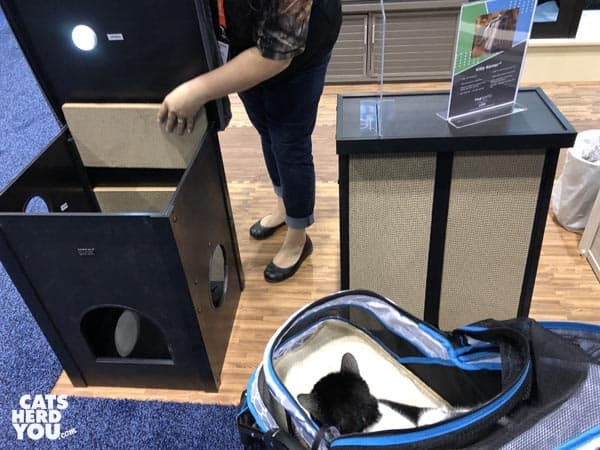 At the New Age Pet booth, she watched attentively while the booth staff demonstrated the litterbox hiding furniture. She decided she absolutely won’t wear this costume. Would it be redundant? 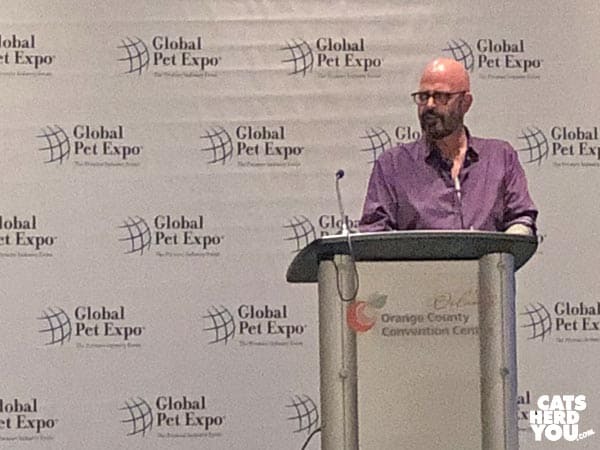 One of the events Cupcake attended was a press conference featuring Jackson Galaxy, the famous cat behaviorist. He came by our table in the press room to see her, and he liked her fist bump, observing it’s similar to the tricks they teach shelter cats in his Cat Positive program. 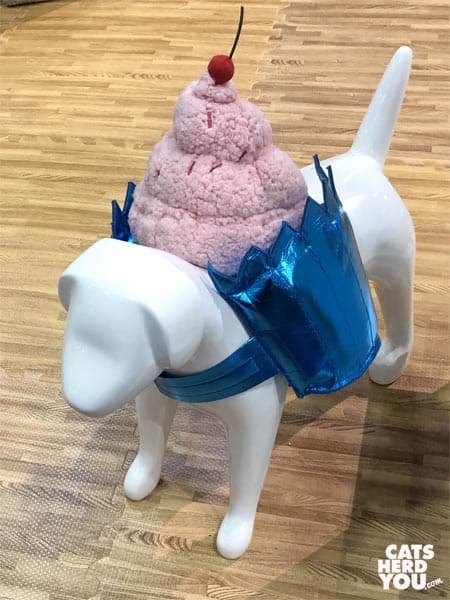 Cupcake spent long days exploring the enormous expo floor and attending events. She was SO good, calmly letting lots of strangers pet her. Pet industry people are better than average people we run into about asking before petting her, which was nice. After the expo ended, Cupcake invited some of her friends who were in town to join her for her weekly coffee shop patio visit. She was all tired out after so much excitement, and she slept the rest of the weekend. 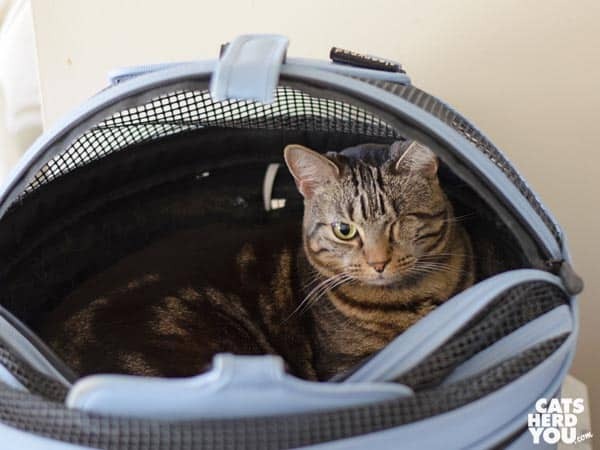 Ashton is a timid cat, and she doesn’t like to try things that are new to her. 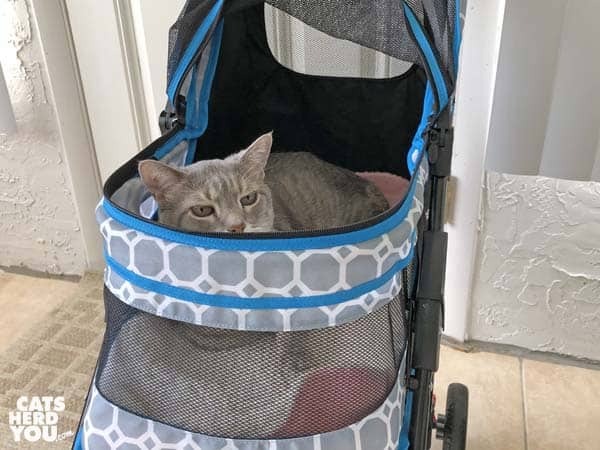 Over the colder months of winter, she noticed it was warmer to sit inside the Sleepypod on the end table than hang out in the drafty sunroom, so she took up residence there, all day long. 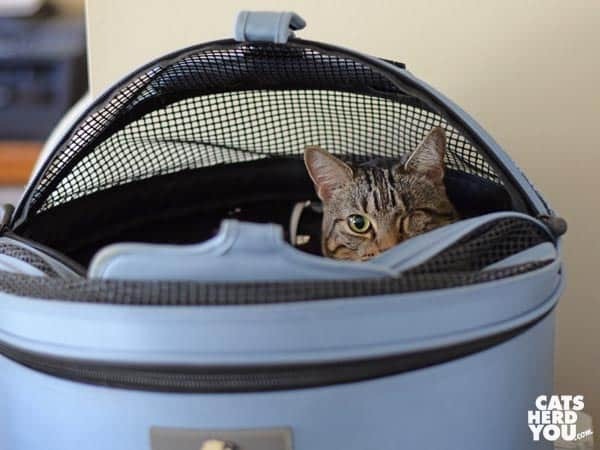 The humans will wonder where Ashton is until they see her little ears move inside the Sleepypod. It isn’t winter any longer, but it’s still her daytime hangout. 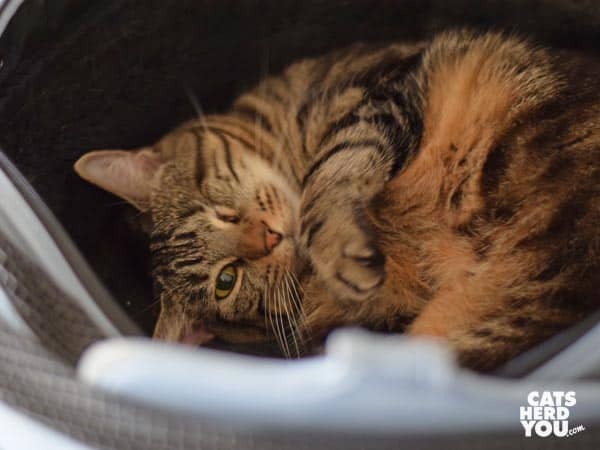 When a trusted human comes near and scritches her chin, Ashton rolls over to show her pumpkin-colored tummy. Pumpkins may be out of season, but Ashton never is.